This Sunday, 2nd September 2012, we're starting our collaboration between Art and Folk. The long established (1983) folk venue Twickfolk have been brave enough to open their doors to me and my sketchbook. Over the next 4 months I'll be drawing the performers, volunteers and audience at the club, which is based at The Cabbage Patch in Twickenham. We'll be exhibiting many of these paintings and sketches in an exhibition in early 2013, a great way to celebrate Twickfolk's 30 year anniversary. Before the summer break I did 3 weeks 'warm-up' and you can see the results on the slideshow to the right. 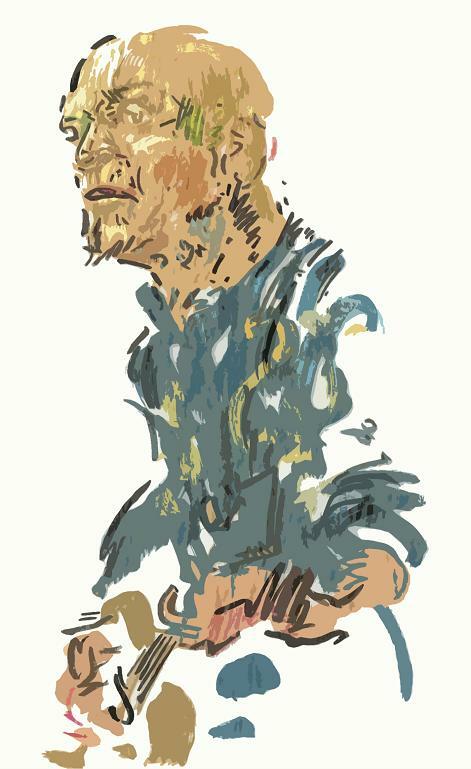 I was really pleased with this painting of Eric Brace who was performing alongside Peter Cooper. This has already been sent to the printers, where it will turned into a 30x44 poster ready for exhibition. Most Sundays I'll be sketching away at Twickfolk, so come and say hello, or visit this blog the following week to see what I've drawn. All thanks to Gerry at Twickfolk who's brave enough to let me loose with my pens and pencils.